Jeeves and Wooster are two popular characters from the works of Sir Peleham Grenville Wodehouse (P.G Wodehouse.) The pair were often found together in short stories, narrated by the eccentric aristocratic Bertie Wooster, to whom Jeeves is a butler. 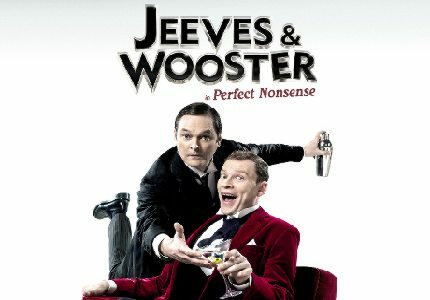 The Perfect Nonsense by Goodale Brothers lifts both Jeeves and Wooster and places them in a new yet familiar narrative. The production makes its West End premier at the Duke of York’s Theatre in October 2013 for a limited season. Like many Jeeves and Wooster stories, The Perfect Nonsense is a whimsical farce. Bertie Wooster takes a seemingly pleasant trip to the countryside, however things take a turn for the worse as Wooster is recruited to marry off the host’s rather soppy daughter, Madeline Bassett to his friend Gussie Fink-Nottie. Wooster enlists the help of his ever faithful butler, Jeeves, in order to complete the task, leading to highly comical circumstances. It soon becomes very clear to the self confessed happy bachelor that if he doesn’t arrange the engagement, he will have to marry drippy, dippy Madeline himself. Yuck! Jeeves and Wooster have previously been brought to life on television by Hugh Laurie and Stephen Fry. However this time the comedy duo is played by Stephen Mangan as Bertie Wooster and Matthew Macfadyen as Jeeves. Mangan is best known for his roles in Green Wing, Episodes and I’m Alan Partridge and Macfayden is well known for playing the delicious Mr Darcy in Pride and Prejudice as well as his television roles in Ripper Street and Criminal Justice. Jeeves and Wooster in The Perfect Nonsense is directed by veteran comedy director, Sean Foley, with set and costume by Alice Power. Whilst the production may not be suitable for young children who will not necessarily understand the cheeky subject matter, older children of 8 years and over who are accompanied by an adult may enjoy the farcical nature of the show.